You’ve seen the look. You know the one you get when you attempt to share with a family member or to a close personal friend the reasons you prep. They want to be polite; they don’t want to seem harsh or judgmental. They are your friends, after all. But they don’t share your beliefs about the need to prepare for an uncertain future. They just cannot fathom a world vastly different from the one in which we are now living. They cannot picture a world economic collapse. That could not happen to the U.S.! They don’t believe that a solar flare could knock out all electronics for a third of the world, much less that rogue nuclear state could intentionally explode a warhead miles above our homes causing an EMP with the same results. Our nation’s leaders would tell us that was so, wouldn’t they? Of course they would. Sure, terrorists may strike on our home soil again, but it’ll be a relatively small event. And we’re doing things to prevent that. We can sleep safe at night. But there are many reason to prepare. Some affect only your family. Some affect the world. And there are many in between. Personal disasters. The most likely tragedy to affect an individual or family is a personal event. It doesn’t affect the nation, just the immediate family. It’s the loss of a job due to a company merger or to lay-offs. It’s the premature and possibly unexpected death of a spouse that sends the family into a sudden tailspin. Those personal disasters happen all of the time. They’ve probably happened right down the street from you and you didn’t even notice. Community. The next most likely event that could affect your life is one that reaches beyond your immediate family. It affects those around you, too. Your neighbors, your community, your township. These events could take the form of natural disasters like flash floods due to a couple of days of heavy rains. Or they may be more sinister like riots caused by an unpopular court ruling. City. Beyond family and community events, we have city-wide activities such as tornados and severe storms. These events stretch into multiple communities and cause a disruption in utility services, in emergency services, and effectively leave you to fend for yourself for a short period of time. Regional. Larger natural disasters, such as hurricanes and earthquakes affect a much broader swath of area. Hurricanes can paralyze several states for an extended period of time. Governmental services may not be available for days, weeks, or even longer. Order may not be restored for quite some time, leaving you to fend for yourself in terms of food, water, and yes, even protection. National. On the national level, disasters are much less likely, but they can still happen. The housing bubble burst not long ago in the U.S. and an economic collapse was narrowly adverted. The mounting national debt in the U.S. may be the next economic tipping point. Or it may be an adversary that strikes. A coordinated series of terrorist strikes, a targeted Electro-Magnetic Pulse warhead, or an attack on the nation’s food or energy supply could disrupt our way of life. Global. And the least likely events affect the entire world. An increasing number of countries defaulting on their financial obligations could a propel the world into a global depression that effectively paralyzes all governments. A significantly sized meteor could strike the earth on land or in the sea causing massive amounts of devastation if not total annihilation. A burst from our sun could project a sudden stream of electro-magnetic radiation that would affect one-half of the earth. The Regional, National, and Global events are far less likely to happen to you than the ones that appear earlier in the list. In fact, if you notice, as the number of people affected by the disaster increases, the likelihood of it occurring decreases proportionally. The nice part about prepping is that the disaster doesn’t really matter to a large extent; your preparations will be largely the same. For example: you’ll want to store six to twelve months worth of food in preparation for bad times. If it’s a lay-off, you can live off your storage for months with few trips to the grocery store. If it’s a regional disaster, your storage will help you survive until services can be restored. If it’s a national or even global disaster, your food storage will help you make it until you ramp up your self-sufficiency efforts. Of course, not everything is the same for all disasters. Some require a greater concern for personal protection and a more elaborate set of security measures. But that’s part of prepping, knowing what to prepare for, and how to prepare for it. When people roll their eyes at me when I tell I prep them I usually ask a question or two. At this point they usually get what I am driving at, prepping is insurance of a different variety. Another comment I get a lot is that I am living my life in fear or that I am ruining my life with worry. In my mind I am doing the exact opposite, to me prepping is taking the worry and fear out of the future by equipping myself for what might happen. People tell me I am wasting my money. I chuckle at this, I am purchasing food, materials and gaining knowledge ALL of which I use, so to me there is no waste in my spending. My Christian friends will mention that I just need to have faith in the Lord that He will provide. I very firmly believe this; I also know that the Lord told Noah to build an Ark, that he put Joseph in place in Egypt so that they could store food and overt massive deaths due to a 7 year famine. I am also convinced that when “it” hits the fan that my ministry will be one that involves spreading the Word of the Lord along with provisions for those that need it. I know about OPSEC and that I won’t be able to feed the world, but I do know that God will bring me people and that my purpose will be to help them. 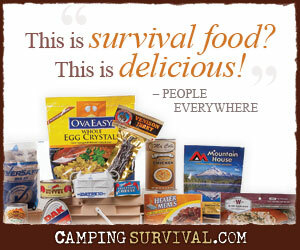 My husband and I are pretty new to prepping and we are having a great time learning about survival. I’ve seen that exact look in people’s eye’s when we’ve talked about it. For now, we only mention that we are building a supply incase there’s an earthquake, volcano eruption (we live in the Pacific NW – I remember Mt. St. Helens) etc. We keep our conversations pretty simple. I’ve told only a few close family members, like our adult children what we are doing and even though they chuckle at us, I’ve made it very clear that if ANYTHING happens that they are to come home. We’ve planned to prep enough for us and our adult children (19, 24 and 27) I’ve also purchased survival backpacks for each of them to carry in their cars. It will be interesting to see how people start changing. It’s almost like you can feel something in the air; a certain unease swirling around. I also live the the Great Pacific N.W.! @ melissa, I dont live on the pacific NW. I live on the eastern seaboard. Welcometo the world of prepping ! People chuckle at me and my wife as well, normally it leads to a short discussion and a change of mind. Where we are the biggest threat is hurricanes, but if it snows here this place shuts down. If youre prepared for one youre prepared for another, and so on and so forth. One of the best things about prepping to me is meeting fellow preppers and expanding the informal network, and learning so much from some really great people. You’re right about sensing something in the air. There seems to be more and more people who are starting to prepare, who are starting to get back to a life of near self-sufficiency, who are planning for a major change in our way of life. If it doesn’t happen and life continues as normal, we’ve lost nothing as Jeff has pointed out in his comment. But if we’re right, then we’re much better prepared. Excellent. And I appreciate your writing style. We are viewed as somehow deficient for not living in ignorance or denial. Many think we are “off” or just plain stupid. Ahh, great quote, Mike. So true.